Arbuscular mycorrhizal (AM) symbiosis regulates root hydraulic properties, but it is not clear whether this involves the cell-to-cell or the apoplastic pathway. Bárzana et al. show that roots of AM plants of maize and tomato enhance the relative apoplastic water flow as compared to non-AM plants, and that this increase is significant both under well-watered and drought-stress conditions. 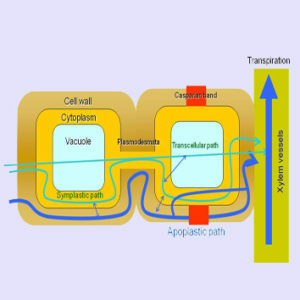 The presence of the AM fungus in the roots of the host plants could modulate switching between apoplastic and cell-to-cell water transport pathways, which may allow a greater flexibility in the response of the plants to water shortage.